As an international market and technology leader in engineered joining technology (joining, connecting and fluid handling technology), offering over 40,000 high-quality products and solutions to approximately 10,000 customers in more than 100 countries, operating with its business partners in a socially and environmentally responsible way is a top priority for NORMA Group Tweet This!. 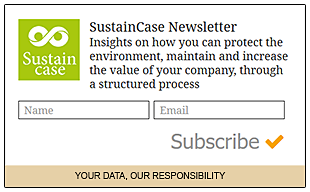 This case study is based on the 2017 CR Report by NORMA Group published on the Global Reporting Initiative Sustainability Disclosure Database that can be found at this link. Through all case studies we aim to demonstrate what CSR/ ESG/ sustainability reporting done responsibly means. Essentially, it means: a) identifying a company’s most important impacts on the environment, economy and society, and b) measuring, managing and changing. In its 2017 CR Report NORMA Group identified a range of material issues, such as customer satisfaction, health and safety, efficient production processes, quality management, elimination of discrimination. Among these, promoting sustainability in purchasing stands out as a key material issue for NORMA Group. To identify and prioritise material topics, NORMA Group engaged with key stakeholder groups through a questionnaire that was completed by over 30 internal and external stakeholders. What actions were taken by NORMA Group to promote sustainability in purchasing? To be better able to assess, compare and manage its suppliers, NORMA Group has introduced Group-wide supplier scoring. Apart from the price, numerous other factors are also taken into consideration, such as quality, cost transparency and logistics services. Most importantly, one of the four pillars of scoring is “sustainability,” in which NORMA Group queries environmental and occupational safety certifications. In 2017, for the first time, a voluntary sustainability self-assessment formed part of NORMA Group’s supplier scoring. NORMA Group asked suppliers for detailed information on social issues (freedom of association, grievance mechanisms and accidents), environmental issues (including CO2 emissions, water consumption and waste management) and, also, compliance issues. The self-assessment was completed by 18% of the suppliers included in the scoring, and NORMA Group has set the goal of increasing participation in the sustainability self-assessment by 5% every year. 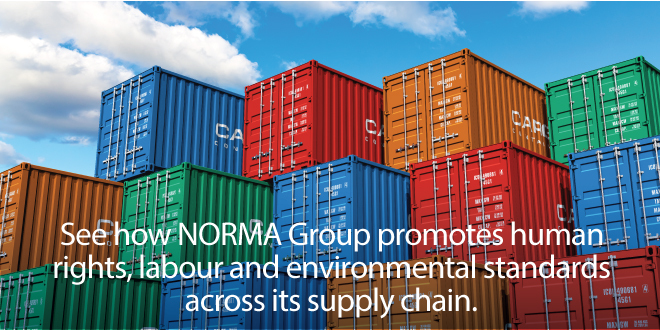 Additionally, NORMA Group aims to embed sustainability aspects in its commodity strategies. Sustainability fact sheets will be created for various commodities, to identify sustainability risks more effectively and minimise them in a targeted manner. NORMA Group tries to exclude conflict minerals from its supply chains as far as possible and has introduced the “Conflict Minerals Roadmap,” to create maximum transparency within the supplier base. The Roadmap is based on the Conflict Minerals Reporting Template (CMRT) of the Conflict Free Sourcing Initiative, which all relevant suppliers had to complete and, in 2016, NORMA Group integrated the management of CMRT into its eSourcing platform, to better evaluate and follow up on feedback from suppliers. NORMA Group also trained purchasers at all sites on the importance of conflict minerals issues and the possible risk related to the materials coming from suppliers who might be involved. In addition, NORMA Group makes sure that 100% of affected suppliers have signed its Supplier Code of Conduct, which requires them to conduct due diligence on conflict minerals issues. Note to NORMA Group: With each case study we send out an email requesting a comment on this case study. If you have not received such an email please contact us.